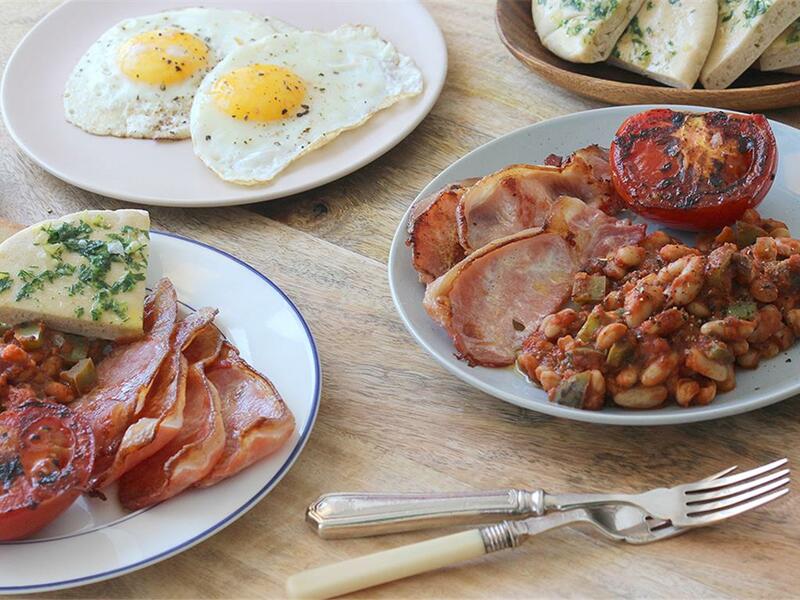 Cannellini beans in a passata sauce served with roast tomatoes, bacon, eggs & toasted garlic butter pitas. Garlic parsley butter: Place a pan on medium heat and add butter (2 tbsp for 4; 1 tbsp for 2). Gently melt the butter and stir in the parsley and HALF the garlic. Remove from the pan and set aside. Bacon, tomato & pita: Using the same pan you used for the garlic parsley butter, turn the heat up to high and cook the tomatoes, cut side down, for 2 minutes until lightly charred. Remove, place on a tin foil lined baking tray with the bacon (no overlapping) and a drizzle of olive oil and roast in the oven for 10 minutes until soft and golden. The bacon should be crispy and golden. In the last 2 minutes of cooking, add the pitas and toast until golden. Remove from the oven and spread the garlic parsley butter over the pitas. Saucy beans: Place a pot on medium-high heat with a drizzle of olive oil. Add the bell pepper and the REST of the garlic and sauté for 1 minute. Add the cannellini beans with the mixed herbs, passata and water (½ cup for 4; ¼ cup for 2). Season with salt and pepper and leave to simmer (gently boil) for 7-10 minutes until the sauce thickens. Season to taste. Eggs: Wipe the pan you used for the tomatoes and turn the heat down to medium-high. Break the eggs into the pan, one at a time and fry sunny side up for 2 minutes until the white is set and the yolk (yellow) is still runny. Season with salt and pepper to taste. Serve the eggs, bacon, tomato halves and saucy beans with the garlic parsley butter pita on the side. "This for me us was more of a Breakfast, which was fine because we made it Saturday morning. "